Be the first to share your favorite memory, photo or story of Derek. This memorial page is dedicated for family, friends and future generations to celebrate the life of their loved one. 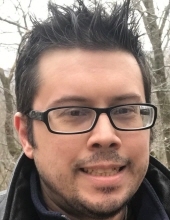 Derek B. Anderson, 38, of Lodi, OH, died unexpectedly Saturday, March 16, 2019. He was born July 10, 1980 in Libertyville, IL. to Carol Seay Rommel and Rory B. Anderson. He attended gifted classes in the schools of Round Lake Beach, IL. At a young age Derek won the city Spelling Bee. He graduated from Wadsworth High School in 1998. Following high marks on college ACT scores, Derek was recruited and attended Ohio State University, with a major focusing on Physics. Derek was an excellent drummer and played in various bands in college and after college. His favorite genre was Progressive Rock, including favorite bands Rush, Metallica, and Dream Theatre. Derek was intimately knowledgeable and passionate about holistic and herbal healing. Derek studied and researched many theories in advanced physics. He made everyone around him laugh with his tremendous sense of humor. He was a kind and caring person and an animal lover. His best friend and companion animal Shadow will miss him very much. Derek is survived by his mother Carol Seay Rommel, Lodi; his sisters Shelby (Timur Mukhodinov) Cleveland; Cheyenne Rommel, Lodi; and brother Erich Rommel (Hayley Demeter), Chippewa Lake; dear family friend Steve Podsiadlo, Lodi. He also leaves his grandparents, Leon Seay (Millie) Gurnee, IL; Francesca Close, Palm Desert, CA. He is also survived by his uncle Leon Seay (Roberta Rutter), Gurnee, IL; aunt Shari Seay (Peter Markiewicz), cousin Sophia, Santa Barbara, CA; uncle Scott Close, Fleming Is., FL; and aunt Vicki and uncle Michael including numerous aunts, uncles, and cousins. He was preceded in death by great grandma Bessie Mae Billot who is waiting with loving arms for her boy Derek, as well as grandfather William Close. Visitation will be Friday, March 22 from 5-8 PM at Parker Funeral Home, 210 Medina Street, Lodi (330-948-1122). "Email Address" would like to share the life celebration of Derek B. Anderson. Click on the "link" to go to share a favorite memory or leave a condolence message for the family.